This auction was won by p***d.
Enjoy a 3 night stay for 2 guests in a Classic Room at Jumeira Rotana Dubai in Satwa, Dubai, UAE. Stay is valued at approximately 4,800 AED / £1,030 GBP / $1,310 USD*. Please note the winner will be required to separately pay the Government Taxes of approximately 50 AED (approx. £10.70 GBP / $13.60 USD) per night as well as for all additional purchases including further meals, drinks, spa treatments, excursions etc.. The winner will also be required to pay a 500 AED (approx. £107 GBP / $136 USD) refundable security deposit to cover any extras that will be incurred later. Auction stay dates: to be booked in advance and taken between 01 April to 30 September 2019, subject to availability. 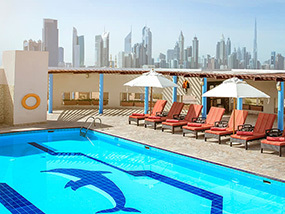 Situated in Dubai, the Pearl of the Arabian Gulf, the Jumeira Rotana conveniently lies just a 10 minute drive from Dubai International Financial Centre and Dubai World Trade Centre and close to The Dubai Mall and Burj Khalifa, making it an ideal destination for both business and leisure travellers. This five storey property boasts 125 rooms with splendid views of the Sheikh Zayed skyline as well as the city of Dubai. All of the rooms and suites are furnished to the highest degree to provide guests with the comfort and warmth of a home away from home. Hotel facilities include: Bodylines Fitness & Wellness Club with its fully equipped gym and rooftop swimming pool; access to private beach club (at a minimal charge), complimentary 24 hour valet parking, complimentary shuttle service to The Dubai Mall and Kite Beach, complimentary wifi access in all guest rooms and public areas and 24 hour reception, currency exchange and room service. In terms of dining, there is The Boston Bar, which serves up refreshing cocktails and alcoholic beverages in addition to a scrumptious à la carte menu of American and British delicacies, while Olive Oil, the all-day dining international restaurant serves an enticing variety of dishes from around the globe for breakfast and dinner. The winner and their guest will be staying in a spacious 40sqm. Classic Room with an expansive area to work or relax with your choice of either king or twin bed. All rooms feature a flat-screen LCD TV featuring international satellite channels; access to wireless internet; daily housekeeping service, fully stocked mini bar, coffee/tea making facilities, safe, bathrobes, hairdryer and IDD service. Luxury Travel Diary terms and conditions apply. *This auction item is valued at approximately 4,800 AED by Jumeira Rotana Dubai, 2nd December Street, Satwa, Dubai, UAE – please note this valuation is the list price provided to Luxury Travel Diary by the Auction Prize Provider and should be used as a guide only as cheaper discounted rates may be available. No cash alternative is available. This auction item excludes flights and transport – you will need to arrange your own flights / transportation to and from your home to Jumeira Rotana Dubai, 2nd December Street, Satwa, Dubai, UAE to coincide with your booking. Your stay is subject to availability, must be booked in advance and taken between 01 April to 30 September 2019. Please note the winner will be required to separately pay the Government Taxes of approximately 50 AED (approx. £10.70 GBP / $13.60 USD) per night as well as for all additional purchases including further meals, drinks, spa treatments, excursions etc.. The winner will also be required to pay a 500 AED (approx. £107 GBP / $136 USD) refundable security deposit to cover any extras that will be incurred later. Please note any associated taxes / resort fees / entrance fees etc. and all additional purchases will be collected from the winner by the relevant property at the time of booking your stay or on departure and will not be deducted from the amount bid for the item. Winners must pay for their auction item in full via PayPal within 48 hours of the auction end. The full Terms of our auctions can be found here. To the fullest extent permitted by law, Luxury Travel Diary will not be liable for any loss or damage arising out of the winners’ use or enjoyment of the prize; and the winner acknowledges that Luxury Travel Diary accepts no responsibility whether directly or indirectly for any claims whatsoever arising in respect of the prizes provided by third party providers or sponsors.